People are the most valuable resource any organization has, and finding the right talent can be a significant challenge in today’s candidate-driven market. The most sought-after skill sets and well-rounded, experienced employees can be hard to find, but the most successful manufacturers are approaching talent cultivation proactively, in lieu of reacting to an immediate growth- or project-driven need. While many are challenged to find the right members for their teams, those winning the war for talent are doing so with a secret weapon: An industry-savvy staffing solutions provider. Through a strategic relationship, manufacturers can gain access to a network of ideal candidates to quickly fill headcount, scale for a project and support exponential growth. For those not using a partner for this critical business need, where should they start? In a NASSCOM-Mckinsey study, experts predict that by 2020 the global gap between supply and incremental demand for qualified engineers will be as high as 74 percent, largely due to industry sensitivities and economic fluctuations. Skills-in-demand change so frequently that predicting the next emerging need takes talent acquisition expertise. In fact, PWC found that only 34 percent of CEOs feel their HR departments are well-prepared for the challenges ahead. This reality paves the way for a proactive hiring strategy that partners internal HR departments, who are experts when it comes to their organizations’ needs, with an organization that brings unique experience and a deep network of talent to the table. It takes the pressure off when seeking part- and full-time staff and allows for multiple roles to be filled quickly and efficiently, with proven, reliable talent. If a candidate isn’t openly looking for a new role but is perfect for an organization’s needs, is there a way to attract them? The great news – yes. Any staffing partner worth its salt is well-versed in how best to turn passive talent, which represents 75 percent of candidates in the market, into active leads for an opening. An ongoing focus on networking, leveraging the right social media channels, asking for referrals and building relationships is what uncovers the best of what the market has to offer – even if those candidates aren’t looking. This all-day, every day talent cultivation is what will bring ideal candidates to the negotiation table – allowing the hiring organization to focus on its core competencies, instead of investing extensive time and resources on finding the right people. For smaller organizations, it empowers the human resources team to hone in on engaging, developing and retaining existing talent. Though it is recommended that engineering and manufacturing firms proactively form a strategic partnership with a staffing solutions provider from the start, there are a handful of scenarios that make it most worthwhile. Flexible roles: When you are looking for a flexible hiring solution, for example, if you have an indefinite need for filled roles, staffing agencies can help you quickly fill your headcount while offering a variety of different hiring options- from temporary positions, to direct hire. It will help you more efficiently tap into the agencies talent database and equip you with the best talent that fits your needs. A staffing resource also can provide you with the option to hire employees temporarily if you do not have the budget or guarantee of keeping them on after a new project is completed, or the option to hire long-term employees if you expect overall business growth. Unexpected turnover: The cost of an unfilled engineering position can reach up to $50,000 per day, so when faced with an unexpected turnover, it’s crucial for engineering and manufacturing firms to turn to supplemental staffing. Not only can they quickly source new employees to stabilize your organization before project timelines are affected, they also ensure existing personnel remain largely unaffected by the turnover. Rather than supporting projects the former employees left behind, they can concentrate on existing workloads, considerably preventing burnout. Facility relocation: While an obvious initiative associated with facility relocation is to fill roles for the new location, many companies underestimate the need for temporary hires at the closing location. Relocation can take anywhere from a few months to several years, but once the news is communicated to existing employees, their priorities might shift to finding full-time work elsewhere (depending on the situation). Having a support arm to step in and temporarily fill these positions takes some of the relocation burden off the business. Staffing providers offer job seekers access to a broad range of opportunities that they might not be privy to on their own. Whether temporary or full-time, working through a staffing solutions contract offers connections to the best brands in the business and offers a more competitive choice with wages, benefits, and even relocation packages. Especially for a young engineer who might be interested in trying out a few different positions or locations before settling down, a staffing agency can give them the ability to choose their commitment level. Additionally, it gives talent the opportunity to build their resume and referral network with many well-known companies that are supported by the staffing firm. Have a proven strategy for recruiting passive, not just active, candidates? Understand the technical and R&D aspect of hiring, as well as the HR/staffing side of the business? Provide a strong employee value proposition and benefits, so as to attract the top candidates? Support a variety of placements ranging from temporary to permanent, short- and long-term and direct hire options to meet most client needs? Have both a local and global presence to support onshore and offshore client requirements? Rank among employers of choice? Have they won any workplace or culture awards? Have strong client retention and work with the top brands in the business? Overall, staffing solutions providers give organizations a unique advantage when it comes to fluctuating employment needs. While many organizations wait until this fluctuation takes place, it is important to view talent management as an integral part of your organization’s success. These five steps will help ensure that your organization is winning the war for talent – and reaping the benefits of a solid partner in the process. Anne Lewandowski is Associate Vice President of Sales, Technical Workforce Solutions for Tata Technologies. With nearly 25 years of experience, she was most recently recognized as the Top Sales Representative, North America, Tata Technologies Fiscal Year 2016. She has contributed greatly to the growth and direction of Tata Technologies for the last 20 years, and her latest strategic thrust is to diversify beyond the automotive sector. During her well-deserved downtime, Anne is an avid golfer and hiker, most recently hiking the Grand Canyon. 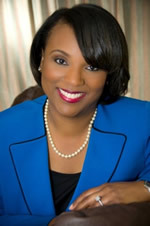 Kimberly Keaton Williams is Vice President, Technical Workforce Solutions at Tata Technologies. She is responsible for Sales, Recruiting, Operations, and Employee Engagement in North America for this business unit. Additionally, Kimberly has responsibility for all talent acquisition at Tata Technologies. Prior to joining TTL in January 2016, Kimberly spent nearly 17 years at Kelly Services working in various capacities including Marketing, Business Development, Recruitment Process Outsourcing, and Temporary Staffing. She has an extensive track record of establishing strong customer relationships, while improving productivity and profitability.